This kusudama is named “Butterfly Kusudama” in YAMAGUCHI Makoto’s book Kusudama Ball Origami and in FUSE Tomoko’s book, 最新 くす玉折り紙 教室/ latest kusudama origami classroom, it is refered to as 花のくす玉/ flower kusudama and is marked as a traditional kusudama. No matter how this kusudama is known it still has 60 units. As most flower kusudamas it has 12 flowers of 5 petals each (the same as Morning Dew, for example). This kusudama shows it’s true colours when folded in a somehow stiffer/ heavier paper; for units of 7x7cm/ 2.8″ a paper or 60grams per square meter is not advised; in my opinion even a 80grams paper isn’t! I used a 100grams paper. I want to fold it again with 5x5cm/ 2″ and I’ll use regular paper to see how it works… Just a note about the paper: it’s a blueish white with “dots” and really small bits of other papers in it. 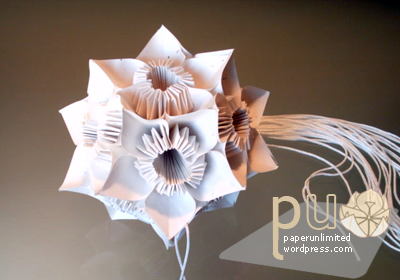 This entry was posted on 2007|11|22 at 13:20 and is filed under kusudama (glued), modular origami. You can follow any responses to this entry through the RSS 2.0 feed. You can leave a response, or trackback from your own site. One girl ask me to make this kusudama: I’ve made B&W one. Really pretty! Wondering if you mind sharing the modular’s diagram as I’m not able to find them on the internet. This kusudama is fantastic and i decided to have kusudama flower models and not natural flowers, so if you can send me how can i make it or a web site, something i would be more then greatful. I made one with special paper that was given to me, but unfortunately I can’t find the proper paper anywhere around here. Do you think I could order some from your supplier? Hi! I’ve been looking for the instructions on how to make this for ages. I used to have the instructions but have lost it. Now I’m stuck with an unfinished kusudama (butterfly). Would you kindly show me the step by step tutorial for this? The most important thing is that you need 60 sheets of paper made specifically for kusudama. Other types of paper will not work – too thin, too big, mismatch colors and so on. As for the folding, the important thing is to practice, once or twice, with a large (8.5 x 8.5) just to get the proper folding. I have the instruction if anybody wants it, but you’ll have to wait until I update my scanner. BTW the instruction comes with the right paper, which I’m still trying to find. Hi there, what an awesome website! The pictures are really quite beautiful. Could you please include me on your list of people to email diagrams to? I have most of it figured out already, I just can’t seem to figure out the reverse-engineering on the inner parts of the flower. It wants to look all “flat” on the top, instead of the additional folds drawing the “pestels” inside of each petal. I’m still waiting for someone to tell me where I can buy the proper paper. I have the instruction from the first set. If you don’t have the instruction, then you don’t have the proper paper because they come together. I have also made this kusudama .Here is a link to it http://anu-origami.blogspot.com/2009/05/kusudama-butterfly.html.I have provided video links for the instruction. For paper you have options like A4 papers( you have to cut it into squares),Post-it notes (I usually use them as the as cut into squares already :P),origami papers can be bought from amazon ,ebay and many online shops.. 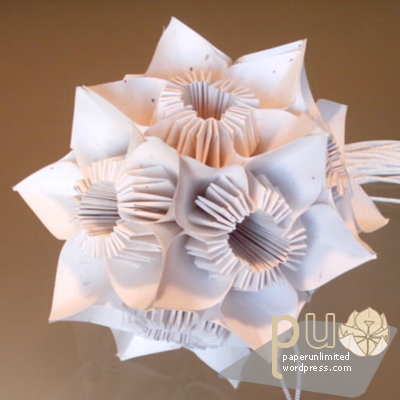 Packs also are available for complete kusudama with instruction like 60 pieces of paper + instructions you can get them from online paper supplies . In my kusudama I had used post it notes for one of them and another one is the standard origami paper cut into 4 pieces. Really pretty! Please tell me the diagram! For the instructions… youtube it, I have found the instructions in a video. You should be able to buy white or coloured 100 gsm paper in packs cheaply enough at any stationers shop and print on it the colour you want… the colour I designed has orange at tip grading through yellow to white at three corners of the square (stamens) and white for the entire last corner (the petal). I can print 2, 4, or 6 squares to a page as I like to change the size. You need 60 of course for the entire ball, but just 5 makes a single flower. I also changed the design very slightly to have the downwards folded tip of the stamens re-folded upwards and pointing out of the flat bits in a zig-zag fold, it looks more like flower stamens.